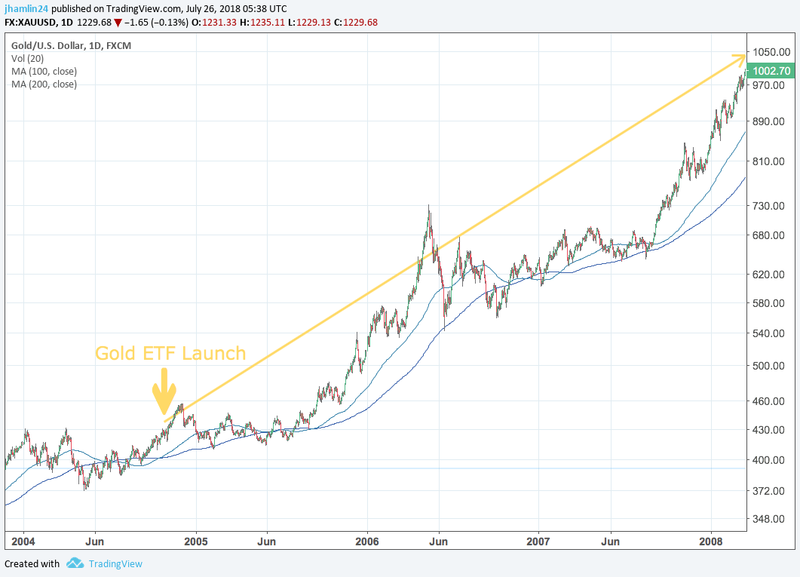 When the first physical gold exchange-traded-fund (ETF) was launched in the United States in November of 2004, it had a huge impact on the gold market. The SPDR Gold Trust made it faster and easier for investors to get exposure to gold. Exchange-traded funds (ETFs) give traders access to the incremental price movements of physical gold, without having to buy physical gold or futures contracts. The more investors that want to buy shares of GLD, the more bars of physical gold the fund has to buy. This increased demand helped to propel the price of gold significantly higher in the months and years following its launch. The gold price increased a whopping 70%, from $430 when the fund was launched to $730 roughly 16 months later. The price continued higher and eventually broke $1,000 per ounce for the first time during March of 2008. The gold price more than doubled in just over three years following the launch of the SPDR gold ETF! Sure, gold was already in a bull cycle when the ETF was introduced, but there was a significant acceleration in the price advance in the few years following its launch. The fund currently holds around $32 billion worth of gold bullion, but it was over $65 billion in 2013. It averages around $800 million per day in volume. The value of all gold-backed ETFs had ballooned to over $150 billion in 2012. Physically-backed gold ETFs as a group are the fourth-largest holder of gold, falling just behind the U.S., Germany and the International Monetary Fund and ahead of Italy and France. The bottom line is that ETFs bring new investors into markets that are otherwise difficult to access. This typically leads to an overall increase in demand and upward price momentum. Consider that ETFs are still a small percentage of overall gold demand, well behind jewelry and bullion demand. And investors could also get exposure via gold mining stocks, well before the gold ETF was launched. Yet the introduction of the gold-backed ETF was still able to have a significant impact on the market. Now consider the potential impact of a Bitcoin ETF that is backed with purchases of actual Bitcoin, of which 21 million will ever be created. Of those 21 million, 17 million are already in existence, meaning only another 4 million will ever be created. This stands is contrast to the CME or CBOE futures markets, where investors are just betting against each other on the price, without any actual Bitcoin being bought or sold. This addition of Bitcoin futures trading didn’t actually add new demand to the market, other than increasing investor sentiment. But a Bitcoin ETF has the potential to add significant demand, particularly from the deep pockets of institutional investors. The launch of a Bitcoin ETF has the potential to attract throws of institutional investors that have thus far stayed away due to lack of regulatory clarity and custodial solutions. The first attempt at a Bitcoin ETF was rejected by the SEC, but this time around the market is more mature and the SEC has loosened rules around ETF applications. Furthermore, it is the CBOE that has submitted the joint ETF proposal by VanEck and SolidX. The SEC has already granted them permission to trade Bitcoin futures and SolidX would offer insurance for investors covering loss or theft of bitcoins held by the trust. The Winklevoss application lacked this safeguard and the CBOE will certainly hold more sway with regulators than the Winklevoss twins. The odds of approval have gone up considerably with the CBOE application. Buying Bitcoin from an exchange and securing them safely requires an advanced level of technical proficiency. A good number of individual investors have stayed clear due to the complexity of the process and unfamiliarity with this new technology. Thus, a Bitcoin ETF will have appeal with institutional and retail investors alike. Bitcoin has a market cap of $141 billion, so the influx of $413 billion in new capital would have a massive impact on prices. And even if the price of Bitcoin were to go up 5x to $40,000, the market cap would still be less than 10% of the gold market. 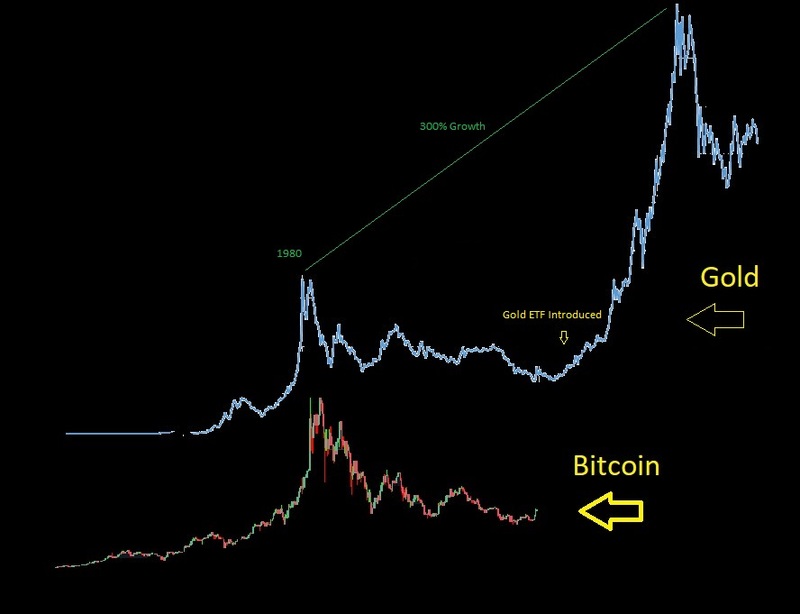 This helps to put the upside potential for Bitcoin in perspective. Take a look at the chart patterns for gold and bitcoin below. They look eerily similar and I believe that we could see the Bitcoin price follow a similar trajectory as the gold price following the launch of the SPDR gold-backed ETF. If so, this could be the last time that we see Bitcoin under $10,000 and the last major buying opportunity for a while. I believe the impact of the Bitcoin ETF on the Bitcoin price will be even more pronounced than the impact of the first U.S.-based gold ETF on the gold price. The SEC is expected to make a decision on September 21st, but some believe that it will be delayed until Q1 of 2019. With the Bitcoin price down over 50% from its 2018 high and starting to rally already, the approval of an ETF could be the catalyst to quickly push the price back toward all-time highs. Get our top cryptocurrency picks, newsletter, trade alerts and ongoing research by becoming a premium member. You can try it out for 3 months at just $195 and we offer a 10% discount if you bypass the legacy financial system and pay in cryptocurrency. P.S. – Our latest cryptocurrency pick is up 12% in the past 24 hours, while the Bitcoin price is down 2%. And while Bitcoin is up over 35% in the past month, our top cryptocurrency pick for 2018 has roughly doubled in the same timeframe. I have no doubt that you will find value in our service, so please consider joining now for instant access.